Earthmoving crews mobilize at the 6 West project in Edwards. The new complex will feature upscale apartment units. 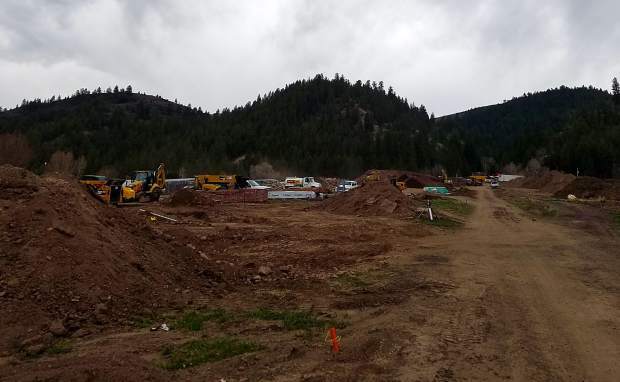 EDWARDS — Crews recently mobilized at the site of Eagle County’s latest multifamily complex — 6 West in Edwards. According to developer Steve Spessard, of Gore Creek Partners, the 120-unit project located on a 5.7-acre tract, is eying a late December, early January opening. By local standards, that is a very ambitious schedule. But for Spessard, it’s the culmination of years of effort. “Since I moved here nine years ago, I have been trying to find a project I could move on close to home,” Spessard said. Spessard’s resume includes developing apartment complexes and student housing in the Houston area. While he considered development of a for-sale project in the valley, market conditions convinced him apartment development would be a better bet. “When you look at the county’s housing study, and reports like that, and then you ride up a life with someone talking about couch surfing, you can see the need is there for rental units,” he said. While 6 West is a rental project, it isn’t like most of the large multifamily complexes in the valley. “This is upscale rental housing for the renter by choice, not the renter by necessity,” said Spessard. Those high caliber finishes will include Energy Star stainless appliances, kitchen pantries, modern finishes, cable and broadband service, stone counter tops, nine-foot ceilings, full-size stacked washers and dryers and walk-in closets. There are 48, 626-square-foot one-bedroom units; 54, 888-square-foot two-bedroom units; and 18, 1,176-square-foot three-bedroom units in the project. Beyond the extras planned in the units themselves, the complex will feature a business center/conference space, a fitness center, cover resident parking, outdoor barbecue/summer kitchen areas, a tot lot for kids, a bark park for dogs and storage space. “We know everyone has to have storage space for all their toys,” Spessard said. The rental prices for the units hasn’t yet been decided. “But it will be comparable to what you can rent a condo for,” Spessard said. As he has presented his 6 West plan to people and organizations valleywide, Spessard said he has gotten a very positive reaction. “I get a lot of questions about when will we be taking applications,” he said. The answer is not yet. In fact, the development doesn’t yet have its website up or its phones connected, but Spessard said the marketing effort for 6 West will launch this summer. For now, he is focused on completing the ground work for the project and starting vertical construction. While development in Eagle County is a pricey proposition — the result of a short building season, materials expense and busy subcontractors — Spessard believes 6 West is well positioned for success. “I felt like Edwards is a good middle point in the valley for a project,” he said. And in the world of marketing, where name recognition is everything, Spessard said the old highway signs along U.S. Highway 6 provided the inspiration for the project’s name.